Windows Media Player (WMP) has almost become an integral part of many Windows users since the 2000s. It is still used by many people to play music and movies. However, Microsoft wants its users to move on from the legendary Windows Media Player and instead use its more modern Movies & TV app. 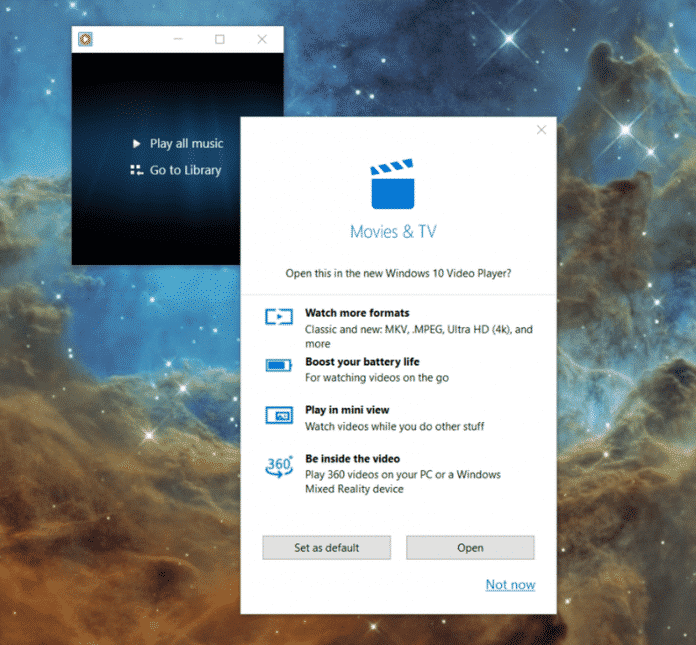 According to a screenshot shared by Reddit user Noam_ha, Microsoft is popping up a message when opening Windows Media Player that asks the users if they want to open the file in the Movies and TV app. The pop-up message advertises the main features of the app, which is better compatibility with modern video formats such as MKV, .MPEG, Ultra HD (4K) and more, better battery life, a mini-view, and support for 360-degree video on PC or a Windows Mixed Reality device. Although for Microsoft, the Movies & TV app maybe the preferred platform for video playback, the application has a horrible user interface and modest functionality. Further, options such as Play Speed settings or queuing videos or streaming a video from an online source, are available in the Windows Media Player but is missing in the Movies & TV app. The default Windows Media Player has since long ceased to receive significant improvements from the time Microsoft launched its Windows 7 based alternative, Movies & TV app. It’s not clear as to why Microsoft is advertising the Movies & TV application when Windows Media Player is enabled in Windows 10. But one can assume that Microsoft is looking to pull down its curtains on the venerable Windows Media Player in the near future. What do you think about the Movies & TV app? Do let us know in the comments mentioned below.